Another milestone for stable apprentice "Tahlia Hope" was reached at Kyneton on Thursday with the promising young jockey notching up her "100th" winner on locally trained mare, Kissee Mee in the 'Rising Stars series. This is her first win in the series and she picks up 12 points. The Rising Star series is for apprentice jockeys only and heats are conducted throughout the state culminating in a final at Flemington in July. Naturally the leading points scorer wins the series but there has been some close finishes with the title going down to the wire in the final race. 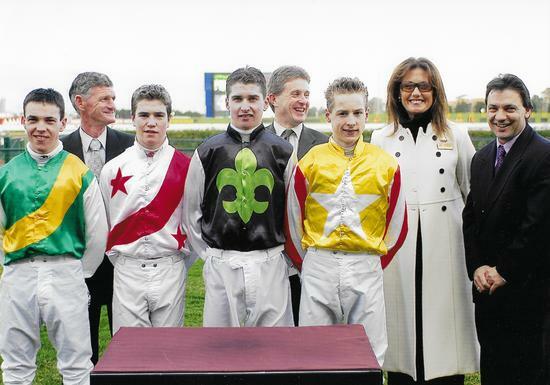 Notably Tahlia's uncle, Blake Shinn won the series in 2004 as a young 16Y0 and secured six points for finishing second on the Butch Bourne trained La Flor D'Luna to take the title by only one point. Pictured with the placegetters in the 2003/2004 series: L-R Ryan Maloney 4th, Brady Cross 3rd, Thomas Campbell 2nd & Blake. This is a series Tahlia would dearly love to win but her main focus at the moment is building her profile in the metropolitan area and reducing her 3kg claim. She has great opportunities coming up over the summer period and will be well sought after by Trainers looking to utilise her claiming allowance.